I reviewed the Pilot Prera a month ago and was impressed by the build quality as well as the writing experience. The Prera delivered a great writing experience no matter what ink I put in it. The Japanese fine nib was a lesson in masterful engineering, and as we have come to expect delivers a finer line than the European equivalent. I also purchased two styles of capless pens to see how customers liked them. 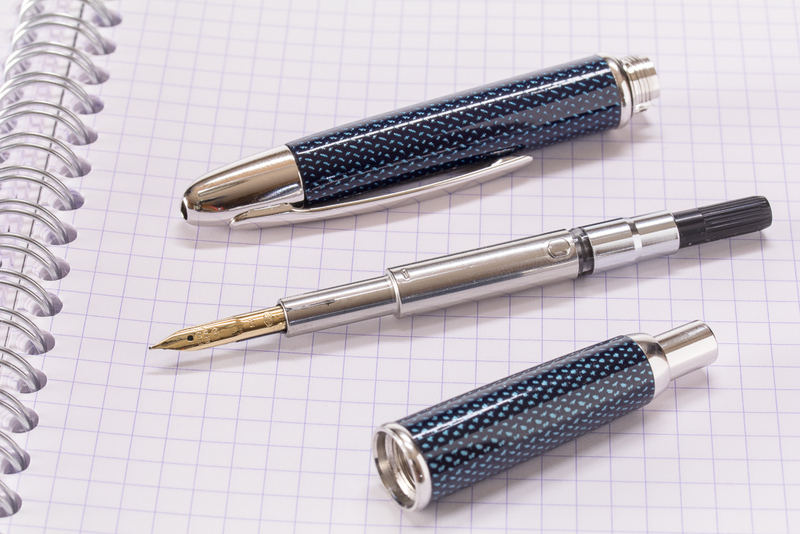 The two pens were the capless Rhodium and Splash. I decided to buy an extra Splash for myself. I wanted to test drive a premium Pilot pen and I was interested in the odd design that other fountain pen users have raved about. What odd design? Well, if you have never seen a Pilot capless pen before then I guarantee you'll take one look and tell me you won't be able to use it! Firstly, there is no cap! But there is a clicker on the end! The clicker is much the same as you would find on a ballpoint pen. And if there is no cap then where is the clip? Well, the clip is attached to the the nib section where you hold the pen to write. Insane right? How the heck could you write with a clip where your fingers should be? The pen is a little ugly even when filled with beautiful Namiki black ink. It's certainly not the most attractive pen I've seen... or is it? The unique look actually grows on you. It can also be a talking point when taken to a networking event or party. The Splash is a solidly built pen and I feel as if a car could roll over it and the car would come off worse. The word workhorse comes to mind. The innards are also a sight to behold. The pen comes fitted with a nib unit that can take the supplied converter or cartridge. A metal cartridge cap can be fitted over the cartridge to allow the clicker to do its job rather than pressing directly on the cartridge. Although the Splash comes with full instructions, just a word of warning. Filling this pen is a little different to filling a regular pen. The nib unit should be taken out of the pen barrel and filled directly rather than submerging the front of the pen into the ink bottle. This allows you to fully submerge the filler hole which is toward the top of the feed but also stops you getting ink into the capping mechanism. I did I said there was no cap but the innovators at Pilot created a front section that contains an internal cap that closes when the nib is retracted. This creates an air-tight seal and prevents the nib from drying out. It certainly works! I didn't use the Spash for a couple of weeks and to my surprise it was ready to write as soon as I picked it up. 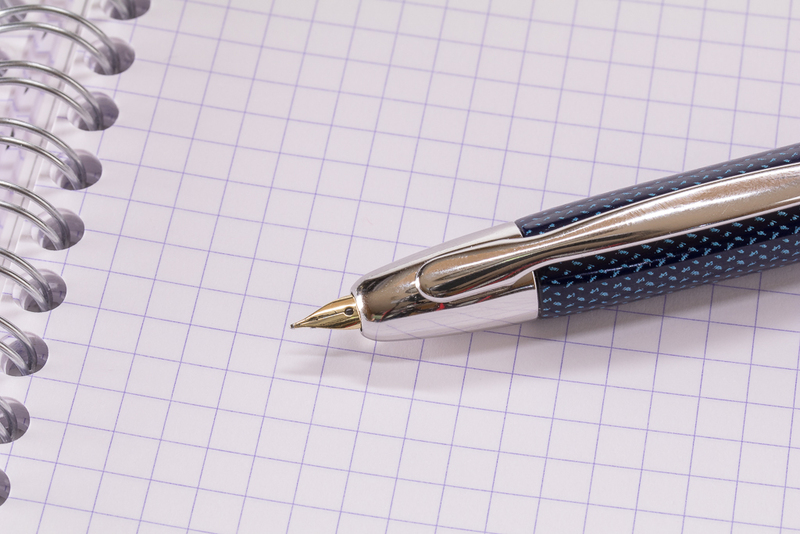 The Splash comes fitted with an 18k gold nib. We only hold fine nibs in stock at this time, but the nib is a joy to use! No skips, no scratches, just a perfect line of ink. I feel like I'm writing with the edge of a razor blade! We've gotten over the strange look of this fountain pen. We have a clicker. We have an interesting nib unit that holds a converter or cartridge. And we have a clip that is apparently going to be in the way of my fingers. So is it? Well... no. It isn't. How odd. In fact you hardly notice the clip at all. With true yoga-fingers I tried to hold the pen in several positions and I didn't find that the clip got in the way at all. The nib unit is only allowed to fit into the pen in one orientation thanks to a cutout and a notch. This mechanism means that the nib can only be oriented in one direction, which in turn means the clip can only be oriented in one direction when held in your hand. It works and well. 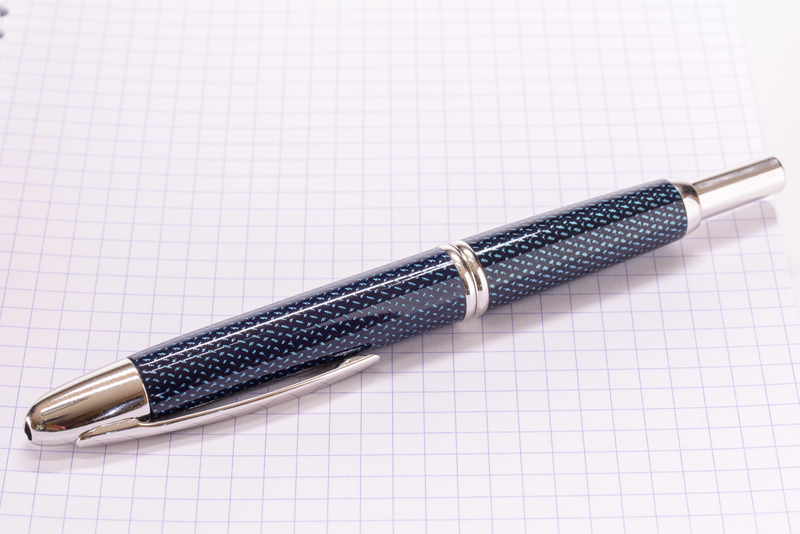 The pen does deliver a beautiful writing experience and is very enjoyable to use. The nib is exceptionally good to write with and delivers a great line. It's a difficult pen to describe in a blog post and almost requires a sit down over a coffee – or a video – to show how cool it is. The size and weight of the pen might prevent it from being my every day writer, but I can see plenty of people will get a huge amount of enjoyment from it. The capless Splash is a premium pen and is on the upper end of the price range, but the engineering is excellent and quality is stunning. I would definitely recommend this pen to aficionados who wanted to buy a treat for themselves. Have you experience with any Pilot capless pen? What do you think of them? Find the Capless Splash at Knight's Writing Company.